The Calgary Flames made a lot of changes to their club over the summer. They have a new coach and roughly half their roster is players either brand-new to their club or the National Hockey League. Getting the team to gel on the ice and bond off the ice is crucial to getting off to a strong start to the season. Luckily for the Flames, the scheduling gods have been on their side. In addition to their preseason trip to China, they have an October schedule heavy on road games. For them to have a successful 2018-19 season, though, it’ll be essential for the Flames to be bad guests. After their home-and-home series with the Vancouver Canucks, the Flames have seven remaining road games in October – overall they have five home and eight road dates in the opening month of the season. Of their seven remaining away games, six look like big challenges. The Flames are sub-.500 (.473 points percentage) at Bridgestone Arena in Nashville, though they have won six of their last seven visits. They’re .431 at Enterprise Center in St. Louis and have lost eight of their last 10 visits. They haven’t won at Madison Square Garden in Manhattan since 2008. They have just six wins ever at Bell Centre in Montreal, though they’ve won three of their last four visits. They have just three wins ever at Scotiabank Arena in Toronto and haven’t won there since 2011. They’ve won just twice at KeyBank Center in Buffalo. Ignoring the quality of the clubs they’re facing, and half are against playoff teams from last season, the Flames are heading into buildings where they’ve historically struggled. The upside is their October is relatively heavy with Eastern Conference opponents, so if they can find their stride they can bank what are effectively “bonus points” in the standings against teams they’re not competing directly against for playoff spots. Their effectiveness against Eastern opponents helped hold them in the playoff race last season before the bottom fell out in their final 20 games. While it’s generally fairly standard for teams to struggle on the road due to the home side having last change – and a few other intangible factors – the Flames were one of the best visiting teams in the NHL in 2017-18. They were tied for eighth in the league in road wins, constricting strongly with their 26th rank in home victories. 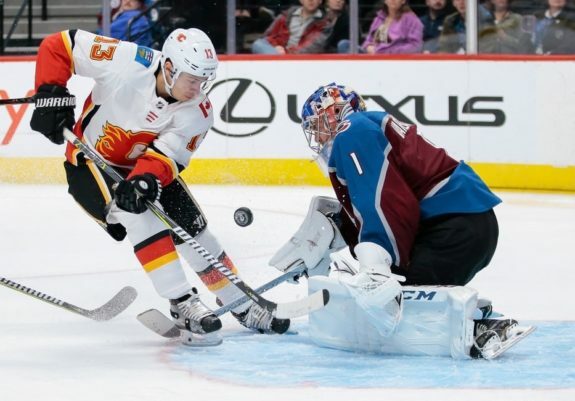 While improving their home record will be a crucial component of the Flames making a return to the Stanley Cup playoffs, their standings survival early in the season will be dependent on their ability to remain successful on the road. A year ago, the Flames had a .500 record in October with an even split between home and road games. They were fairly uneven at home, but they played a simple, direct game on the road. That disconnect simultaneously drew praise from then-coach Glen Gulutzan but must’ve been a bit befuddling to him as well. But the psychology of it, from a player’s standpoint, makes sense: since the road team doesn’t have any control over who they’re playing against, they seemingly focus on playing a simpler brand of hockey and maximizing their scoring chances when they get them, in contrast with home performances last season that were arguably a bit too fancy. At home, the Flames looked for the perfect play, while they just settled for what they were given on the road. The Flames were a top-heavy bunch in 2017-18, with their first two lines generating the majority of their offense. This made them vulnerable to line-matching during the road games, as often their opponents utilized their best shutdown groups against them to negate the effectiveness of the Sean Monahan and Mikael Backlund lines. The changes the club made in the off-season, particularly adding forward depth, were partially aimed at confounding line-matching by opposition coaches. Jankowski and Prout odd men out. For the home side, the choices against the Flames are to try to isolate their top six forwards (and take your chances with James Neal’s third line) or target their bottom six forwards and see if the home team’s bottom six can fare well against Johnny Gaudreau, Matthew Tkachuk and the rest of the top two lines. While the Flames have a shallow defensive group given a recent injury to Travis Hamonic, their forward group’s depth and versatility could be the key to success away from home.